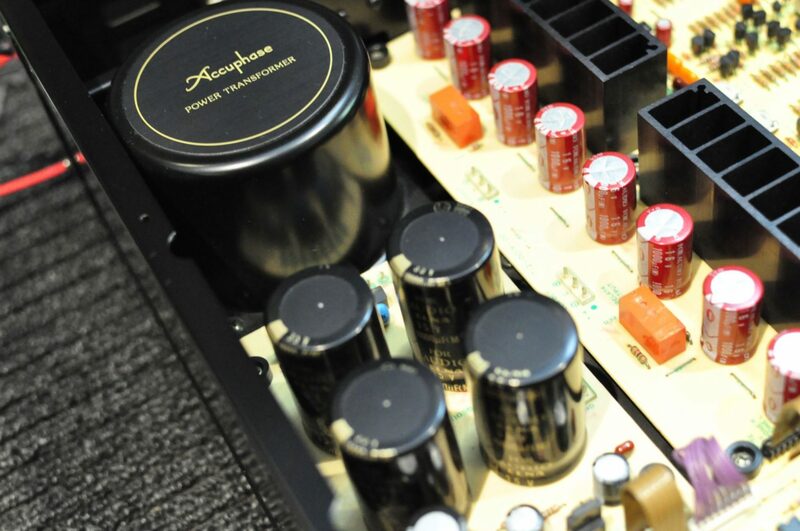 The Accuphase C-202 is a line-level, class-A, fully balanced preamplifier. It also features a dedicated CD buffer circuit, with very little in the signal path. By any measure, it is a superb piece of gear. It’s not one of Accuphase’s best known pieces which is good news if you decide to buy one. Prices for this 11kg Japanese made beauty remain very reasonable. Layout of the C-202. Note the large number of high-value electrolytic capacitors. More on this later. Key design features include fully balanced circuitry from input to output, JFETs at every stage, completely symmetrical layout, class-A operation and zero ICs or capacitors in the signal path. 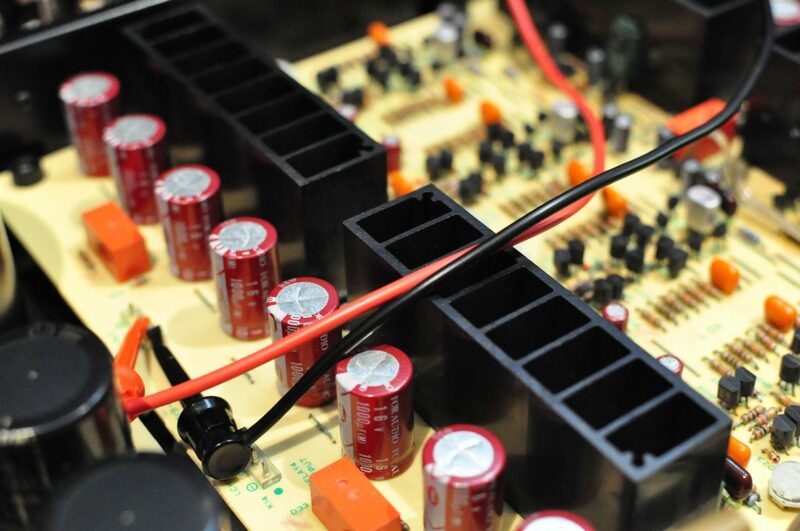 Main power supply, featuring large toroidal transformer, and 40,000uF of reservoir capacitance, more than many amplifiers! 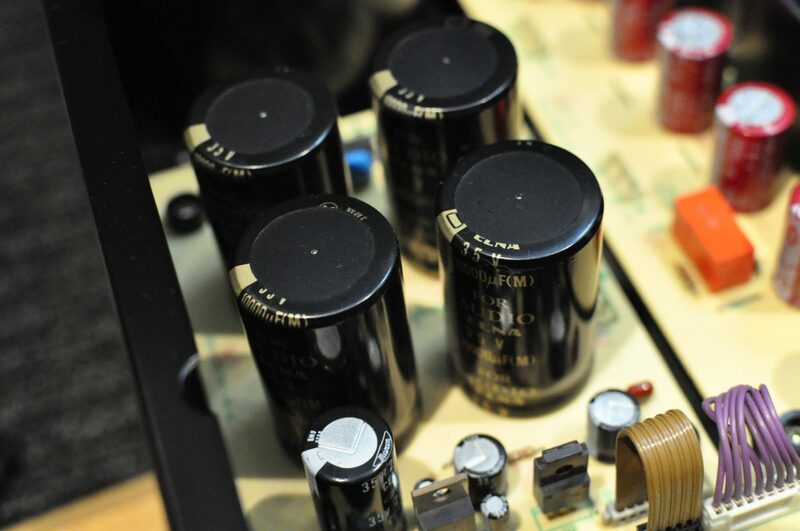 Closer view of the ‘Elna for Audio’ main filter capacitors. Input end of the C-202. Note the four dual JFET input packages. Note also the array of high-quality Elna 1,000uF electrolytic capacitors, located where they are needed, minimising power supply source impedance. There are 16 of these 1,000uF caps, this certainly is a ‘luxurious’ circuit design, to coin a term Accuphase use in their literature. Here we see TO-220 FET output devices mounted to large heat-sinks, dissipating the heat generated by class-A operation. The C-202 draws 40 watts all the time, courtesy of class-A operation. That’s more than most modern power amplifiers dissipate at idle. She gets warm, but not hot, thermal design is excellent and the chassis well ventilated. The C-202 has some useful features for those who like their preamps to actually have functionality. For example, there are three switchable outputs, two unbalanced, one balanced. This is useful because you can feed high-end balanced amps, I use it to provide two seperate feeds to my B&W subwoofer. In this way, I have two separate subwoofer set-ups, one for hi-fi, one for home cinema. I just switch the output selector according to what I’m doing. There’s also a built-in headphone amplifier, capable of driving phones of up to 100 Ohms impedance. The C-202 will drive my HD580’s, which are rated at 300 Ohms, but it isn’t totally happy doing so. Still, this is better than having no headphone amp at all. Headphone socket and output switching. It’s only when you have these features on a preamp that you realise just how useful they are. 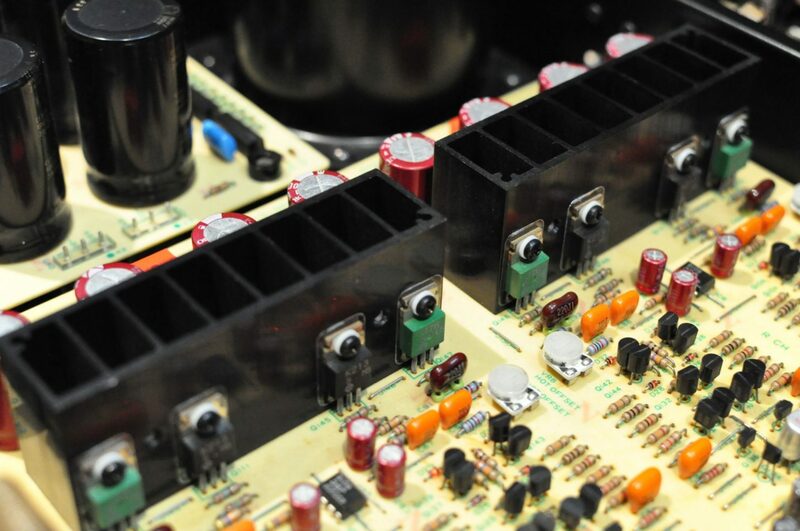 One of the most interesting features is the dedicated CD circuit, separate from the other line level inputs. The CD circuit features a dedicated volume control and bypasses the additional controls and switches under the flap, providing the most direct signal path possible. You can also select balanced or unbalanced inputs for this dedicated CD buffer. Two volume controls, but why not? It guarantees the purest signal path for the CD input and this is how my DACs are connected. There is full tape monitoring and switching provided, great if you are getting into cassette tape again, as I am right now. There’s even an attenuator button, which drops the volume by 20dB, useful if you get a phone call, have an overly hot source, or what to change something and return to precisely the same volume setting. I could go on, but let’s just say the C-202 is not short on features. About the only thing it doesn’t have is a built-in phono preamp. 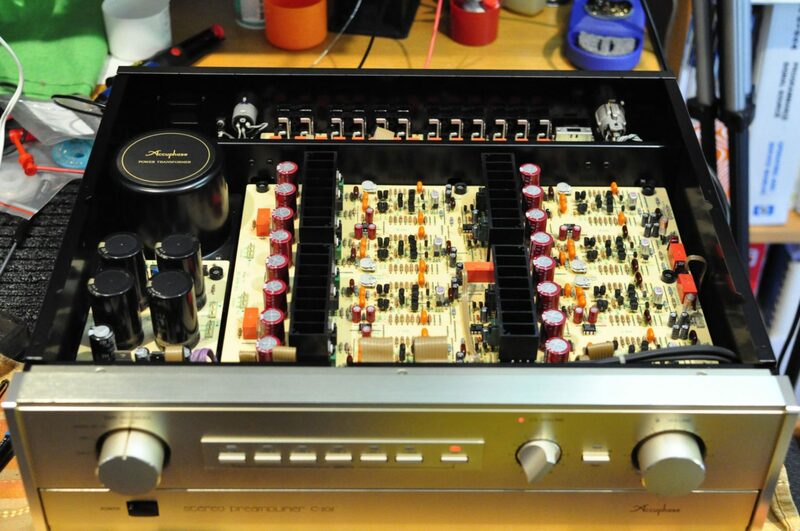 The C-202 is a reliable and superbly constructed preamp as one would expect of Accuphase. The inputs electronically switched via relays, so there isn’t much to go wrong there. There are some mechanical switches under the front panel flap though, these might need standard service, over time. This unit was previously owned by a smoker. I removed the main circuit board to address some dry joints and clean the tobacco residue which was causing issues with some of the mechanical switches. I use a washing process, based on how test and measurement equipment is cleaned. This process effectively removes just about every last trace of residue and contamination from board and other parts. You easily can see the completely symmetrical arrangement of the hot and cold elements of each channel. It costs a lot to build something this way. This image shows the board after washing / drying. After drying and reinstalling the main board, I left the C-202 to warm up for a couple of hours. Referring to the service manual, I adjusted all eight DC offset adjustments for each of the two balanced amplifier stages per channel and replaced a blown fuse. The service manual is critically important here. I was finally able to locate a hard copy of my own and it’s now one of the most treasured manuals in my collection! Note the beautifully symmetrical arrangement of components, with the same signal paths, same trace lengths etc. Here we just see the 8 x 1,000uF filter caps, plus the heat-sinks for the first bank of transistors. 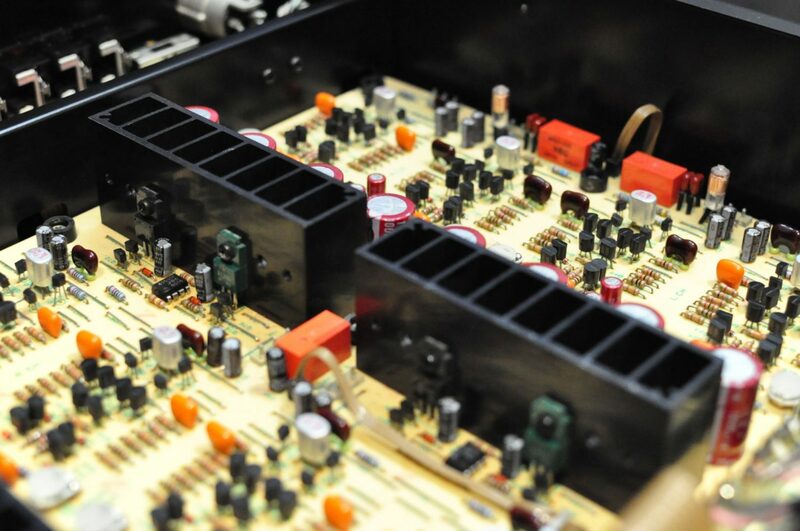 Behind them are a second bank of eight Elna 1,000uF reservoir capacitors. The two leads are for my test setup. This makes for a total of 40,000 + 16,000uF of energy storage in this preamp, 56,000uF in total, way more than many amplifiers. Why Aren’t All Preamps Made Like This? Simple, it costs too much to build regular consumer equipment this way. Sure, zero capacitors in the signal path is the best way to go. But this requires DC servo circuitry for every stage, expensive to design and implement. It also requires eight adjustments per preamp on the production line, and this adds to the unit cost. 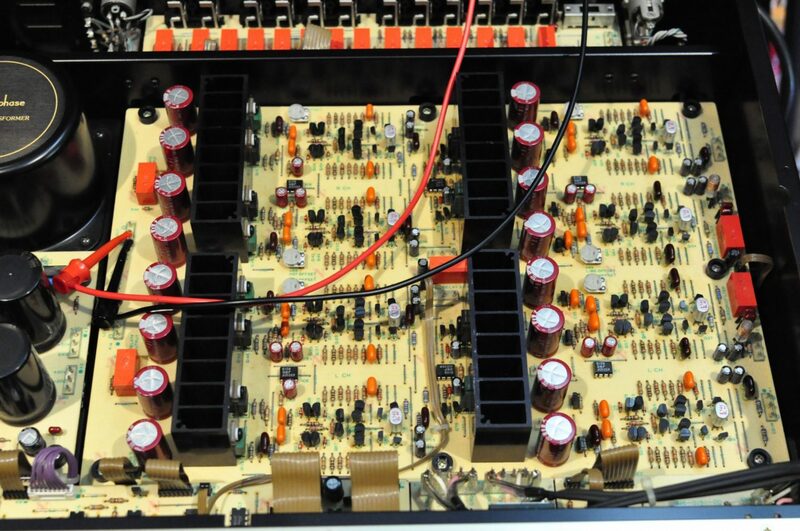 FETs are expensive and there are lots of them in this preamplifier. Add in the heat-sinks for class-A operation, other closely matched components needed for balanced operation, and the costs keep rising. How does the C-202 sound? In a word, sublime. You would expect this, given the design, premium parts and beautiful layout. Deep, clean bass, sparking, airy highs, grain-free, fluid mids. This preamp has all that you’d expect in a premium preamp, and more. She is dead quiet and of course produces her very best when fed with a balanced signal into the dedicated CD buffer. You get what you pay for with audio gear and this preamp is a good example of that. Having said that, the Accuphase C-202 is still one of the best kept secrets in audio. Not many people know about them or how amazing they are, so prices are still sensible. If you need a line level preamp, I can hardly imagine anything better. Hi, Im planing to buy this pre amp but is 100v, in my country we use 120V. Is the transformer multivoltage?. Can i change it by rewiring? Hi, this depends on the individual example and you would need to check the one you are purchasing. Mine was configurable, but I’d suggest checking your unit to be certain as the same model can vary depending on original country of sale. If not, you can always use a small step down transformer, 100 watts would be enough. I have a C 222, and I am planning on buying this C202. In your opinion, sonically, would that be astep up or down? Please share your thoughts. I would really appreciate that. The C-202 is a line level only, fully balanced class-A preamp, quite different from the C-222, which is single-ended only. The Class A, push-pull, fully balanced layout, plus the dedicated, balanced CD only input make this preamp quite unique. Truly an awesome line level only preamp, but you need a very good phono stage to match! I still have two questions, hope you won’t mind. Is it ok to leave C 202 on all the time? 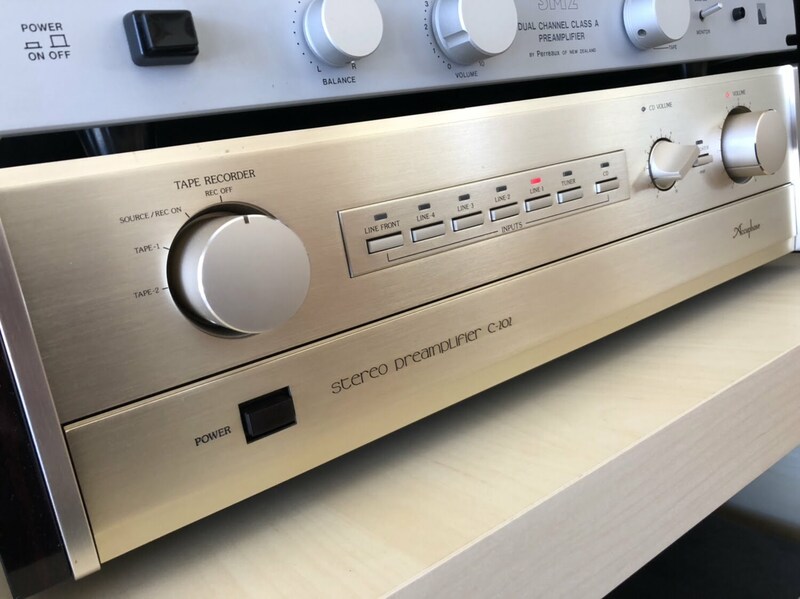 Second, would it accommodate those Accuphase cards in the back for analog playback, or would you suggest a separate phono stage, which would go perfectly with this preamp? Many Thanks for your educational and informative response Mike. OK to leave on all the time, though bear in mind it constantly dissipates around 40 watts due to class A operation and I would still turn it off when not in use. It does not accommodate cards, it’s a line level only preamp. You would need to choose a phono pre or pre and transformer to suit your requirements and budget, though any phono pre will interface with the line level inputs of the C-202. I currently have the Accuphase e-470 and was wondering how the c-202 pre would go up against the inbuilt e-470 pre. If I was to introduce a c-202 into the mix do you have an opinion on how this mix of old and new may sound? Given my setup incorporates a 5.1 surround config is it possible to configure something similar to HT bypass/ext pre in the C-202? Hi Paul, the main thing to consider here is that the E-470 is an integrated, so it contains more compromises. The C-202 is a dedicated, fully balanced, FET input, class-A line level preamp. It’s an extraordinary sounding piece of gear and I would be staggered if it didn’t sound better than the E-470 pre and most others for that matter. In terms of old and new, one has to be careful in applying any significance to that. We are chasing accurate sound, the age of the gear is largely irrelevant. Ultimately, a combination of the C-202 and a seperate Accuphase power amp would be a better way to go, but expensive of course! I use my C-202 as part of a home cinema / 2 channel system and it works well, it’s very configurable with lots of inputs and outputs. I have an opportunity to pick one of these up at the moment. Being a fan of your site and its reviews of vintage gear I am tempted. Its age is a bit of a concern to me as would be determining the condition of its internals. It looks pretty clean externally. No problem. 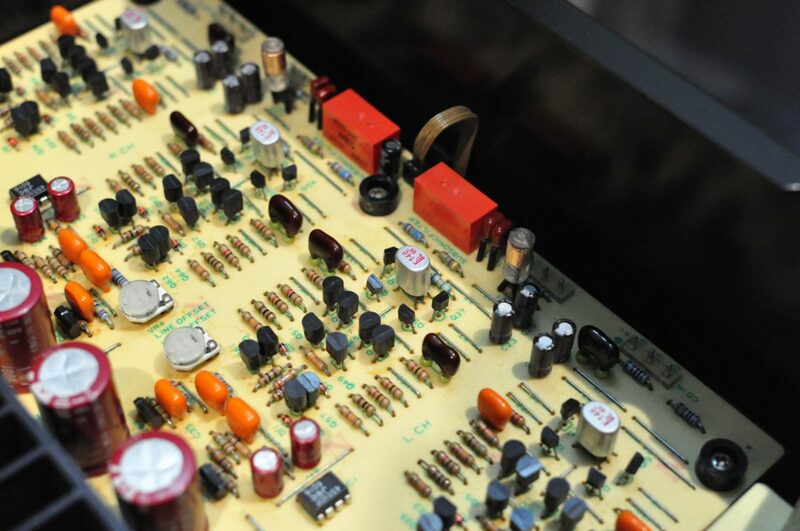 There’s not much to worry about age-wise, Accuphase used premium capacitors, mechanical and other parts parts and it’s likely they will all be perfect. There are quite a few internal adjustments, so you should have her serviced by someone with the necessary skills and access to the service manual, which is extraordinarily hard to come by. I’ve serviced mine a couple of times but all capacitors are original. Other than the service consideration which applies to any piece of electronics more than 10 years old, there’s nothing to worry about.